The Baker High School Marching Band marched in six parades this year. However, the most important one for them is the Mystics of Time parade. The Mystics of Time organization launched the Champions of the Street Marching Band Competition starting in 2013, with the goal of attracting bands from across the Southeast to compete. The bands were judged on their performances during the parade for how well they played the music and if everybody was on step. The first-place winner receives a trophy and $500. Second place gets a trophy and $300, and third place wins a trophy and $200. All three bands that win get an automatic invitation to the next Mystics of Time parade the following year. The parade was supposed to roll out on February 10th, but it was postponed until the next Monday because of incoming weather. The band was still able to go downtown on Saturday and perform for the Queen’s Ball that night. On Monday, Baker ended up being the only band to show up for the competition! What a great way to end the parade season. 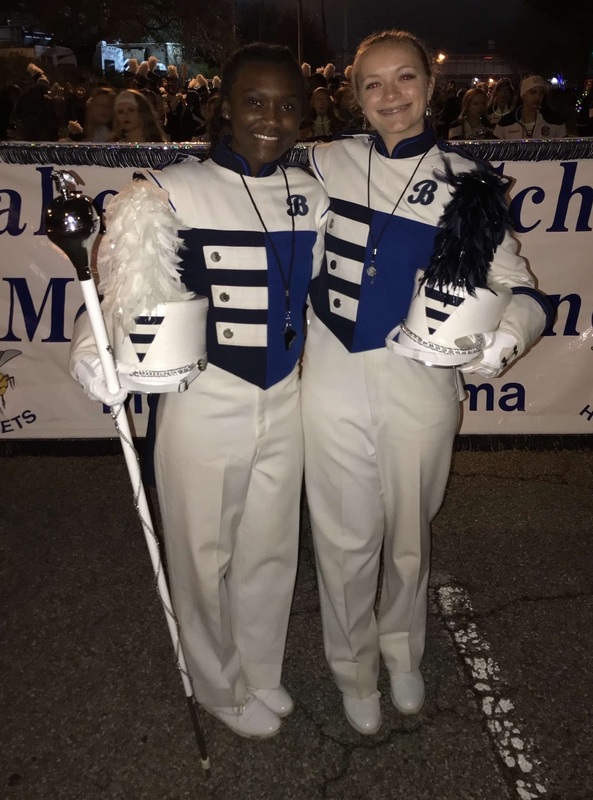 Asia Hope and Isabelle Ferguson, Baker's drum majors pictured above.